Vigorous energy is now emanating from Korea University (KU) here and there. Walking on the campus, one can frequently see other KU students filling out the recommendation forms for the candidates. Recommendation and Candidate Registration Period is being held for three days, from November 19 to 21. This whole enrollment is for the election of the 51th Korea University Student Union (KUSU), whose Voting Period starts from December 5 to 7. 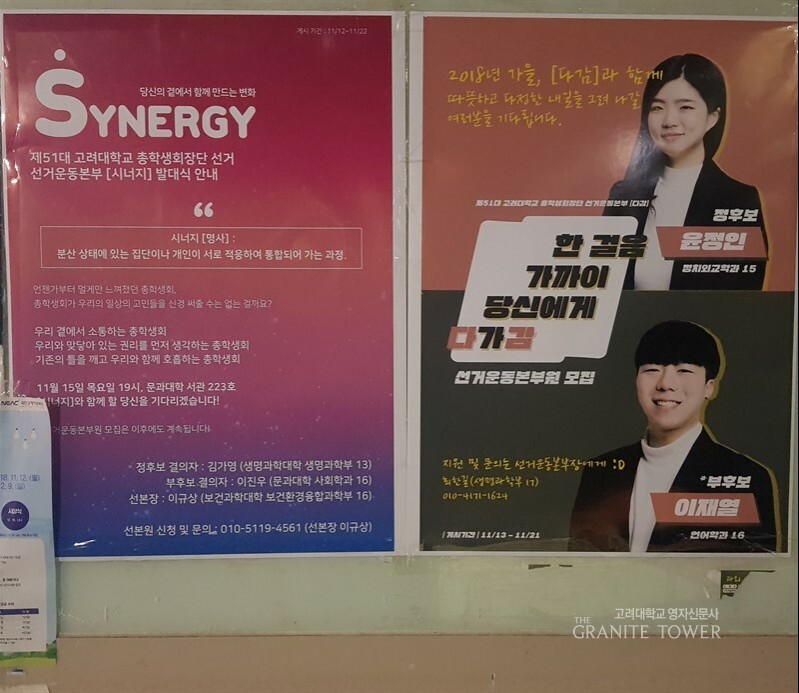 Two candidates named SYNERGY and Da-gam recently came up with five main campaign pledges each, both of which promise to ameliorate the educational environments in the Science and Engineering Campus as one of the promises. From SYNERGY, Kim Ga-young (’13, Life Sciences) and Lee Jin-woo (’16, Sociology) are running as a president and as a vice president respectively. SYNERGY stated promises such as implementing the student petition system, abolition of core general studies course, improving the environment for experiments, introducing the reverse route of KU shuttle bus and finally taking measures about the prohibition of the alcohol sales in the KU May Festival. From Da-gam, Yoon Jung-in (’15, Political Science and International Relations) and Lee Jae-yeol (’16, Linguistics) announced their candidacy for president and vice president respectively. Da-gam addressed pledges such as improving the course registration system, normalizing the cafeteria and other facilities of the Science and Engineering Campus, introducing the student petition system, establishing the student security consultative groups and frequent communication with the newly elected president of KU.